OH CHRIST GET IT OUT OF MY HEAD! oh my dog!! what the duck!? KIDS GET IN THE CAR! 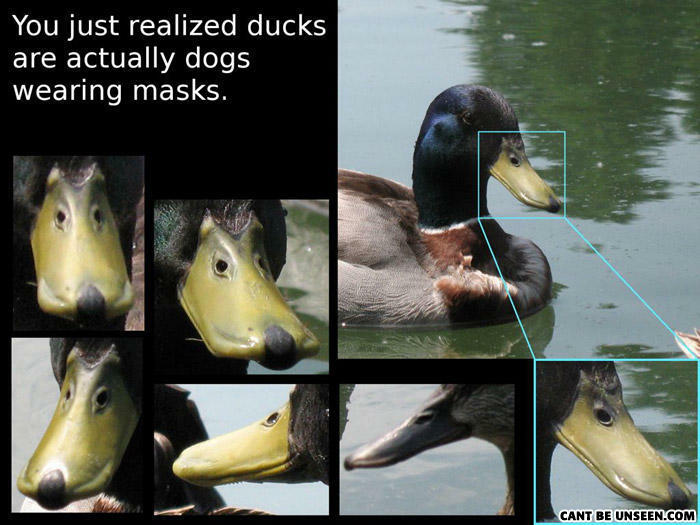 It's a Dog Mask wearing a Duck. I see the dog's costume, but where's its mask? That's scary. Oh my god. I JUST REALIZED THAT DUCKS ARE ALWAYS SMILING! Does this mean that all girls that duckface are actually doing a dogface instead? It's like a primitive Pluto!!! i yelled this out in class toda evrybody looked at me wierdly. h. o. l. y. s. h. i. t.
It would be better to say "Masks wearing duck"
YOU MEAN DUCKS WEARING DOG MASKS. GEEZ, PEOPLE, GET IT RIGHT. It's Hitlers dog. Kill it! Kill it! Or are tiny dogs wearing duck bodies?! Why doesn't it bark then, damnit? What's the difference between a tomato and a rhinoceros? Neither of them can ride a bicycle. Is there a mirror in your pocket?... Because if so, you should probably take it out and, uh, fix what you have going on there.